One of my favorite sources of inspiration for color and form is flickr. While my flickr favorites include many polymer clay pieces, I love exploring other mediums through flickr as well. 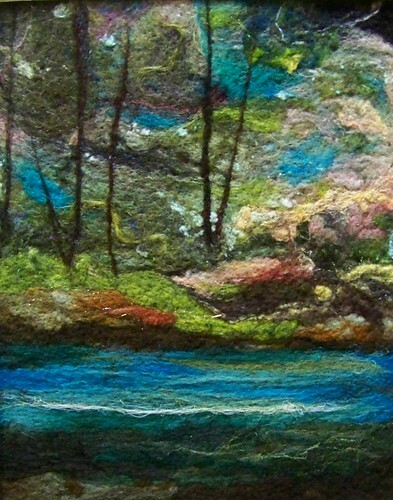 If you haven’t looked at felting in a while, you are likely to be amazed at the variety of new work being done in this medium. 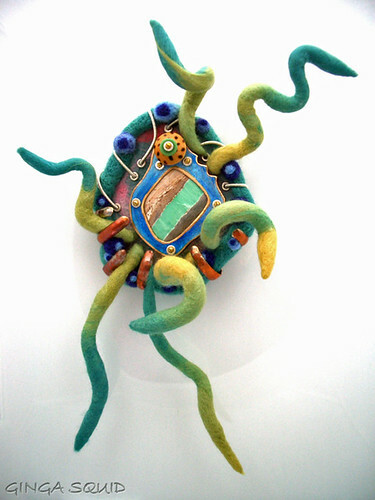 This mixed media piece, “Parasite Variscite” by “Ginga Squid” includes plexiglass, sterling silver, wool, silk threads, copper (heat patina, prismacolor, etched), brass microscrews, fine silver heishi and recycled green glass. 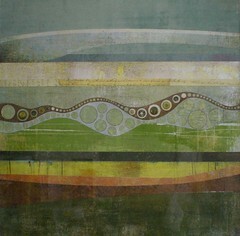 I love pictorial quilts and have used them as sources of color inspiration for years. The quilted panel at the right, by Judy Coates Perez, is a rich combination of color, form and texture. 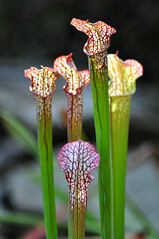 The variety of textures is particularly apparent in the closeup below. I find flickr images that thrill and inspire me by going to the sites of artists whose work I know and love, then following their links to their favorites to see what inspires them. A click of the mouse transports me into a whole new world of artistry and possibilities. Of course this can go on indefinitely… favorites taking me to new artists whose favorites take me to other new artists, and so on. This activity has made for some very late nights. This carved wood sculpture appeals to me for its rich color, sensuosity and its mellow patina that begs to be touched. I love the way the Georgia O’Keefe like form emerges from the natural bark-covered trunk. This collage made of paper and new and vintage and old watch gears and pieces by Letha Colleen Myers (below). And this sculpture made of stacked pebbles on native stone by “irOny,” among many, many others. If you’ve never found images like this on flickr, I invite you to start with my own favorites. 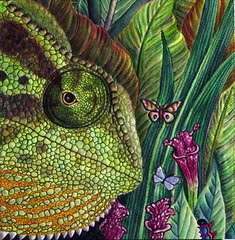 This entry was posted in Color, Sources of Inspiration and tagged Carol Simmons, Color, Color Mixing, Kaleidoscope Canes, polymer clay, Polymer Clay Classes, Polymer Clay Colorado, Polymer Clay Teachers, Polymer Clay Techniques, Polymer Clay Workshops. Bookmark the permalink. Well. you better get started! Wow – what fabulous fiber art. Thanks for sharing! You’re welcome. 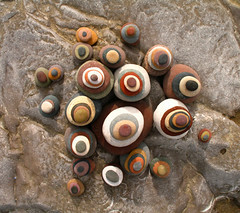 I love the ceramics on your blog too. Loved the flicker site. Find I am spending more time reading, checking out blogs and getting inspiration from sites I never would have found on my own. Thanks for the sharing.! You are welcome, Marty. It did take a lot of time, mainly trying to format the page in wordpress with its limited flexibility. I’m glad you enjoyed it. Great tips, specially the one about checking other peoples favorites. It is a great source for inspiration and can lead to other mediums that inspire as well. I became a contact with someone a while ago and upon searching her Fav’s i found someone;se doing fractal geometry art and kaleidoscoping their own photos. I havn’t tried it yet but I find the most amazing color palettes. Check out my fav’s & you’ll see the FRACTALs and follw them to ???? Thanks, Jan. I’ve looked at the fractal sites also. There is a free kaleidoscoping program for PCs at http://whizical.com. I’ve played with it for several years. Besides just enjoying the designs, I find that the kaleidoscoping process gives me new perspectives on the color combinations. You give it a picture and there are zillions of variations you can chose from. There isn’t a Mac version, though. I’ll look it up !! I too find most of my inspiration out of the polymer world and then work to move it into the polymer world. I started my blog ornamentalelements.com as a journal of my ‘travels’ through color, fashion, trends, and design. When my muse leaves town I can always refer to some of my posts as a jump start for a new design. I was thinking of you when I was writing this post. I’ve used your blog http://ornamentalelements.com for inspiration many times and I recommend it to others! Thanks for the comment. I’m so happy to have found your site. I love your favorites on Flickr too. Your work – the colors and details – just makes my heart sing! What a lovely compliment! Thank you Jill.